Dr. Patel is both a dentist and a physician, completing both his dental and medical degrees at Columbia University. He finished his residency in Oral & Maxillofacial Surgery at Columbia Presbyterian Medical Center in New York City. During his training, he participated with Healing the Children in the countries of Colombia and Ecuador treating children with cleft lips and palates. Dr. Patel was also part of one of the first teams involved in CT guided dental implant placement at Columbia University. 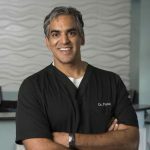 Dr. Patel was born and raised in Philadelphia and went to Boston University for college. Dr. Patel and his wife enjoy spending time together and enjoy traveling. Teeth-in-an-Hour is an innovative implant placement method that significantly shortens the time between placing implants and attaching the finished restoration. Not only does this process reduce the time frame for replacing teeth, but it ensures patients have a fully functional smile. At Lorton Springfield Dental Implant & Oral Surgery, we are committed to delivering a tooth replacement process that is simple and stress-free. Powered by Dentists on the Cutting Edge | This is a secure website for dentists.